When you visit Reformation Lutheran Church you'll be greeted by people just like you, people who struggle with the usual difficulties of life. We are a congregation of people who know that we are not OK with God because of what we do, but because of what God has done for us in Christ Jesus. That knowledge determines our approach to "worship." In fact, we prefer to call our church service "Divine Service" because we recognize that we come before God to receive His gifts to us in Christ Jesus. We believe that anything we do in reference to God is nothing more than a grateful response to the blessings God pours out on us in Jesus. You won't get pumped up like you do listening to a motivational speaker, but you will hear why and how your sins are forgiven in Christ. If you enter the main doors of our building, you will find yourself in the narthex, a room where you can speak with people, hang your coat, etc. Please sign our guest register. If you pass through the next set of doors you will find yourself in the nave, or the place where the congregation sits. You will notice that the dominant color is red. There are two reasons for this. The first has to do with the name of the congregation. Red is the symbolic color for the Holy Spirit, and therefore the color for the Feast of Reformation is red. It is the Holy Spirit that preserves the church, and the Holy Spirit that brought about the reformation of the western church. The second reason for the color red is that it reminds us of the blood Jesus shed for our salvation. The color red symbolizing His blood is behind the cross and comes down and into the congregation. You will also see several very important pieces of furniture which have been called by scoffers "The four dumb idols." Far from being silent, these pieces of furniture visually proclaim salvation. The piece closest to you is the Baptismal Font. It has 8 sides reminding us that as 8 people were saved in the waters of the flood, so Baptism now saves us (1Peter 3:18-22). The 8 sides also proclaim resurrection--the new eternal day or "8th day." The Trinitarian Invocation, Absolution, and Benediction are spoken over the font because of their intimate connection with Baptism. Directly behind the Baptismal Font is the Altar. The Altar reminds us that our sins are only forgiven because Jesus sacrificed Himself for us. He is the Passover Lamb of God, and just like the Children of Israel ate the flesh of the sacrifice when they celebrated the Passover, so God's people continue to partake of Christ's body and blood which was sacrificed for us. In front on your left and right are the lectern and pulpit. God's word is read from the lectern and and preached from the pulpit. The stepping up into the pulpit and lectern reminds us of the passage: "How beautiful upon the mountains are the feet of those who bring good news (Gospel). Behind the lectern and pulpit are two stools. These stools are known as the "confessional stools." They traditionally are the place where the (Lutheran) pastor sits to hear private confession. They remind us that Lutherans retain private confession for the sake of the absolution which is then tailored to the individual. The relationship between congregation and pastor in the Lutheran church is very unique. It is based on trust, and centered in forgiveness. The pastor exists in the congregation as God's way of making sure the pure Gospel is preached and the Sacraments correctly administered. We are a confessional Lutheran congregation. 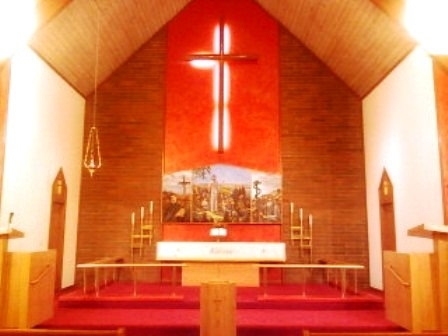 Our services are liturgical, and we use The Lutheran Hymnal.